The accuracy of studies on ancient bones of interest to archaeologists and paleontologists can be improved thanks to a new procedure designed by scientists in France. Ancient human and animal bones give us an idea of what the climate and environment were like throughout geological history. They can also give us information on past diets and lifestyles. Unfortunately, the changes that occur to bone once it has been buried in the ground, called diagenesis, can modify bone fossils and limit their use as proxies. Matthieu Lebon, from the National Museum of Natural History in Paris, and colleagues, have applied a method currently used in modern biomedical applications called synchrotron radiation Fourier transform infrared (SR-FTIR) microspectroscopy, to understand the fossilisation process of ancient bone. 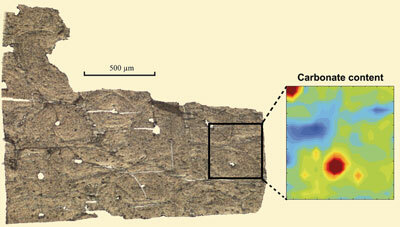 The team prepared samples for analysis by impregnating the bone with a resin and then cutting off very thin sections. This allowed them to sample sites within the bone, irrespective of the preservation state, without affecting the structure. They then applied SR-FTIR microspectroscopy and found that they could determine the molecular composition and structural properties of the bone at the microscale, a resolution not possible with other techniques. They observed different patterns of collagen-phosphate ratios and crystallinity levels in the bone, which could help in understanding the different effects that diagenesis has on ancient bone, and also in selecting the best sections for carbon dating and palaeo-diet analysis. 'The information provided by fossil bone composition plays an increasing role in current archaeological and paleontological research. Understanding fossilisation processes and evaluating preservation state are crucial when selecting the sample or the part of the sample that can provide the more reliable information, particularly in the framework of palaeo-isotopic studies,' says Lebon. Lebon hopes to apply the procedure to more varied fossil samples. The team's goal is to be able to model diagenesis according to specific climate and sediment in archaeological sites.